This bold new search engine optimized responsive website, designed and developed by DDA for Atlantic Gasket, puts the company's high quality gaskets in the best light on the World Wide Web. 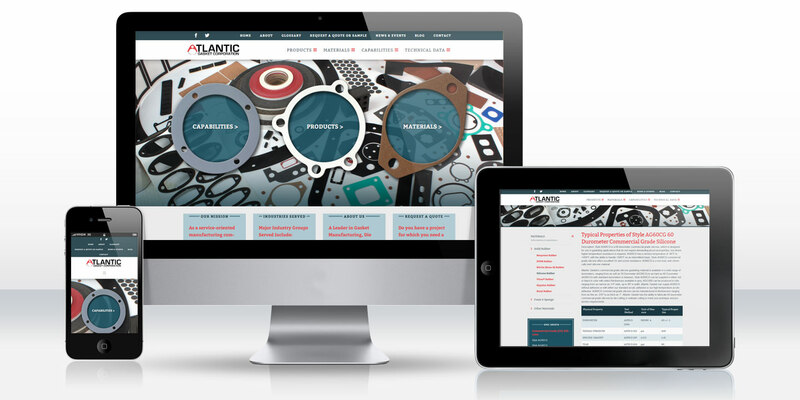 Click here to view the Atlantic Gasket responsive website. DDA designed the original Atlantic Gasket Corporation website in 2006. Despite the 10-year-old design, the site was still contemporary looking, but changes to search engine algorithms meant that it was time for a substantial overhaul. The original website design was built primarily for desktops and laptops. Now, with over half of all web searches coming from smartphones and other mobile devices, and with Google responding by creating a separate search index for those searching on said devices, Atlantic Gasket needed to find a way to capture these searches with high rankings. This was becoming especially important as Google announced that those websites that do not have a mobile-optimized presentation will be increasingly demerited when people search from mobile devices. Atlantic Gasket had prioritized its rank on the major search engines highly from the start, with the website featuring well over 200 pages of relevant content—with much of that content written by DDA's own professional SEO copywriters. In order to protect and extend the website's search engine optimization value, it was time to redesign the website so that mobile users would receive just as high quality of a presentation and user experience as desktop and laptop users. Furthermore, the opportunity would be used to launch a major design exercise to make the website look more modern, while also taking the opportunity to update the content throughout the website where needed to ensure that all content was accurate and up to date. DDA felt the best solution to the new SEO challenges was to design and develop a new responsive website. Responsive websites automatically change their layout and presentation depending on the screen size and dimensions of the device presenting them, and feature user interfaces that work just as well with a mouse as with a touch screen. The beauty to this solution is that, unlike designing a separate mobile-optimized site to target that market, Atlantic Gasket would be able to apply one new design exercise that would be targeted to users regardless of their device, helping them save money while keeping a contemporary presentation on the web for users regardless of their method of access. The new website would also be launched on a secure, HTTPS-encrypted URL to accommodate Google's demand that websites are fully secured to achieve optimal rankings. The new design would feature an open layout with colorful top-page design elements featuring new product photography of their gaskets; textual information and statistical forms would be presented in an uncluttered and eminently legible manner. A new menu system would strengthen intra-site navigation while adding visual appeal, and a blog would allow the client to add relevant content over time for improved SEO value. Furthermore, all technical sheets previously integrated to the website as PDFs would be converted to HTML format for better presentation to the search engines, further leveraging the content available on the site for broader exposure to online audiences. The new Atlantic Gasket customized website design features a unique menu system, with a main menu permanently anchored to the top of the browser window, and secondary menus to the left side that allow users to navigate between pages within any of the main menu categories. The homepage displays a large, colorful image presentation showing a DDA photo of the company's gaskets, with three larger gaskets presented on top to navigate to one of the three main sections of the website: Capabilities, Products, and Materials. Both the homepage and the top-page menus feature animations that make the website come alive and add interest to the user experience, helping to make the company's online presence stand above its industry competitors. The unique navigational system demonstrates the substantial results one can achieve when form meets function. DDA provided its consulting services to help the client craft strong search engine optimized website content with all the revisions they sought to put in place with the new website. A new blog system was incorporated, and DDA populated the client's initial few blogs while explaining best SEO practices for their future population and management of this content. The client expanded site content beyond the initial set by generating separate and more comprehensive information on their product lines; specification sheets previously available only as PDFs were converted to HTML to strengthen the website's SEO value further. The statistical tables found throughout the site were also converted into a responsive design to ensure proper presentation of this information regardless of device used to access the website. The new Atlantic Gasket responsive website is a perfect example of how a business can demonstrate its commitment to exceptional quality through an eye-appealing and easy-to-use website. Throughout the design and development process, Atlantic Gasket offered its praise over and over again. The client's comments upon approval for launch were especially appreciative: "Thanks for all of your help and we are looking forward to going live in the morning. The site looks awesome! You and your team did a great job and have a lot to be proud of. Thanks for all of the hard work that everyone put into this project."